2.) relaxed separates although she was known to wear the tightest dresses in Hollywood, many of her sexiest and most loved looks are centered around relaxed separates. 3.) understated accessories She was often photographed dripping with jewels or wearing elaborate earrings for the red carpet but on her own time, Marilyn stuck to understated accessories or none at all. 4.) messy curls Marilyn experimented with all different hair styles and lengths but her messy curls are my favorite look! 5.) A neutral color palette In her personal wardrobe, she chose mostly neutral colors like white, cream, black, peach, blue and red. Marilyn definitely played with bold colors and patterns on occasion so don't be afraid to break out of your comfort zone every once in a while! 6.) 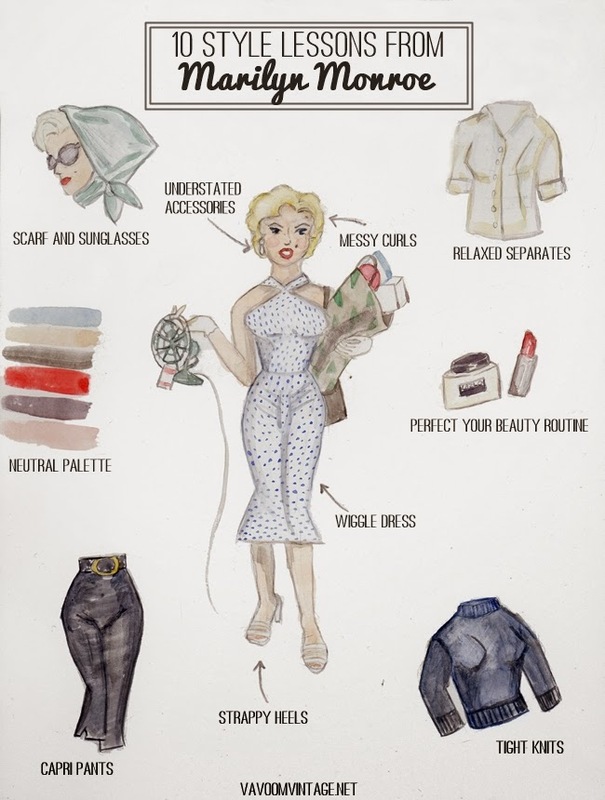 perfect your beauty routine Marilyn's iconic look was attributed to her top secret beauty routine. Along with her makeup artist, she spent years figuring out what worked for her but once she found the products she loved, she kept them on hand at all times. 7.) wiggle dresses She was the queen of the wiggle with dresses tailored to fit perfectly in all of the right places. My favorite is this dress worn with Arthur Miller in England. If I were her, I would have never worn another dress again! 8.) capri pants you don't have to load your closet with impossibly tight wiggle dresses to bring a little Marilyn into your wardrobe. She loved to relax in capri pants paired with a sweater, button up or crop top. Look for well fitting capris in solids and patterns. 9.) strappy heels Marilyn must have had the most amazing show collection. She had 40 pairs made especially for her by Salvatore Ferragamo. Although she wore kitten heels, pumps, even flats, she was often spotted in a great strappy heel. What a lovely inspiration. Often when we think of Marilyn we picture the famous white dress or the pink bow dress. It's a nice reminder that she had everyday style that was much more simple, yet still amazingly classic and simple. Love it! Thanks for sharing all of this. She's definitely an icon. I don't see much on Marilyn's style, thanks for the tutorial! Absolutely love your Marilyn style illustration! I love seeing Marilyn in relaxed clothing. She's still so glamorous. It took me the longest time to realize that you do the illustrations for the blog. They're so cute and sweet! I love these style tips, and I appreciate the reminder to invest in some nice separates instead of drooling over dresses all the time. And that photo with #5 - breathtaking. With all of the artiface that went into being Marilyn, it's easy to forget just how naturally beautiful she was. I love Marilyn, I wish I could perfect a messy curl! She was a beauty for sure! Super fun post! Your illustrations are so beautiful and sweet, Brittany. I hope you'll keep creating and sharing more of them, be they of vintage celebs or anyone/anything else, with us, dear gal. This is one of the many reasons Marilyn in my go to style icon! You know: no matter what the media "discovers" and no matter what is written about her - that darling lady will always remain a gem, to me. There is so much to learn from her, and than you for glorifying the Marilyn on this wonderful place of yours. What a fun post, and so relatable to everyone. Except for the bullet bras/tops. I'm not sure i could ever pull that off, but I do love her classic style and all the great advice you've included. Did you do the art in the first image? Love it.